Find our cheapest flights to Singapore from Auckland, Wellington, Christchurch, Queenstown and more. Explore the tropical hub of Southeast Asia and discover a city that mixes past and present in an exotically exciting way. Singapore is the ultimate modern Asian city; a melting pot of people, business, design and ideas. Often called the Lion City, this convenient gateway to Southeast Asia has a dazzling skyline, which makes it one of the best places in the world to enjoy a rooftop cocktail or catch a giant ferris wheel view. Within Singapore's futuristic cityscape, you'll discover fascinating glimpses of the past. Iconic landmarks such as the luxurious colonial Raffles Hotel, the many churches, temples and mosques of Pagoda Street, and the city's colourful street festivals portray a fascinating diversity of architectural styles and personal beliefs. You'll feel the layers of generations in Chinatown too, where you can chow down on hot bowls of Singaporean laksa alongside the locals and explore traditional street markets selling all kinds of unusual trinkets. Innovation and tradition are woven together to create the sparkling diversity and endless opportunities that are the Singapore experience. Singapore truly is heaven on earth for shoppers - and if the city's famous tropical heat gets too much while you're exploring the markets, you can find relief by simply nipping into one of its many air-conditioned malls and hawker centres. 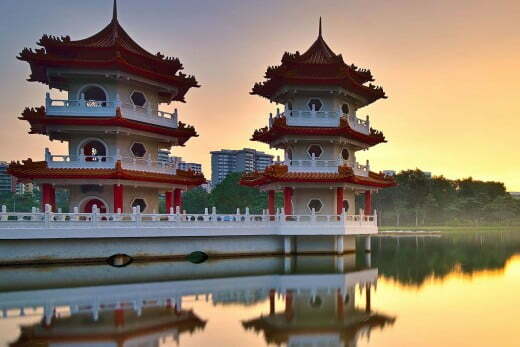 You'll also find respite from the bustling city in any of Singapore's extensive green spaces. For something truly innovative try the 101-heactare Gardens by the Bay, which has two cooled conservatories, Mediterranean plants, an incredible light show and more. Or visit the historic 82-hectare Singapore Botanic Gardens, a World Heritage site where you can get back to nature among thousands of plants species, beautiful lakes and artistic sculptures. Apart from an increase in rainfall from November to January, Singapore's climate is fairly consistent. Expect plenty of rain and sunshine, high humidity and daytime temperatures of around 30 °C. Obviously this will depend on your tastes and what you want to do. As a rough guide, not including air travel and hotels, you should allow about USD $150 a day per person for food and entertainment. There are no mandatory vaccinations required for visitors to Singapore, unless you come from a yellow-fever area (parts of Africa and South America). Singapore is not a malaria area, but dengue fever is a concern, so use mosquito repellent. You do not require a visa to enter Singapore if you have travel documents (usually a passport valid for at least six months from arrival) issued by New Zealand, Australia, Japan, China, Canada, United States, United Kingdom or other EU countries. However, a visa is required if you have travel documents issued by one of more than 30 countries listed on the Singapore Immigration and Checkpoints Authority website. Chinatown image courtesy of Afur Wong.